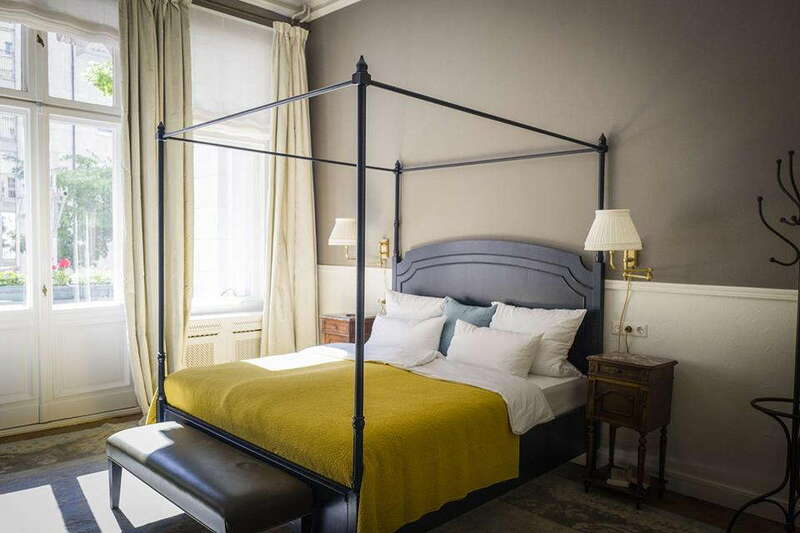 Set in an 1899 cultural heritage building in pretty Charlottenburg, the boutique hotel opened in 2016 following an almost complete renovation, which kept its original stucco ceilings, wood floors and grand salons. 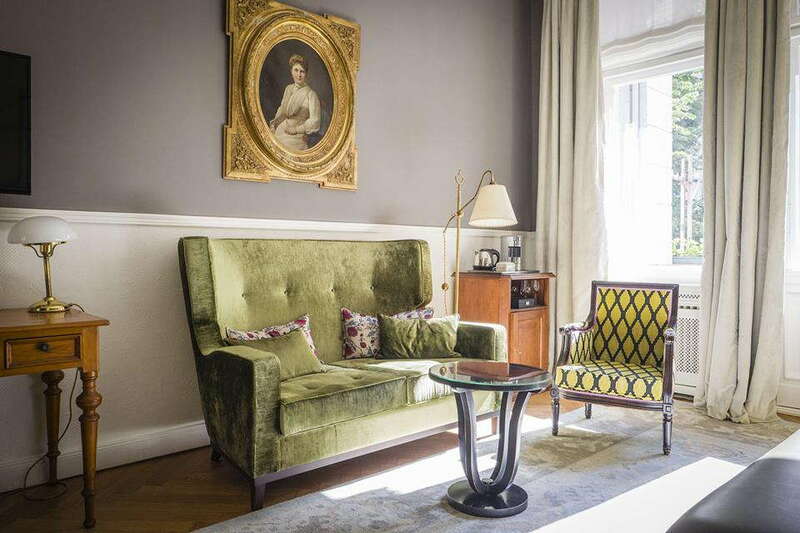 Rooms spread across four floors and two buildings, and are filled with a mix of refurbished pieces and antiques. While it has limited amenities—no full-service restaurant, gym or spa—the historic details and homey atmosphere fit in perfectly with the neighborhood. 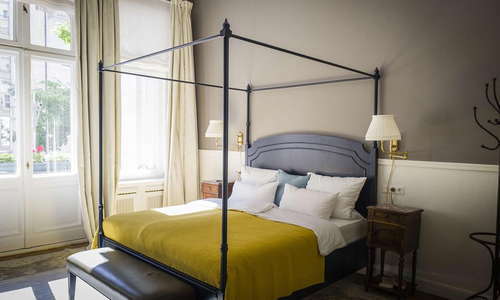 Each room varies in size and color scheme, with beautiful antiques and period-style furnishings set in high-ceilinged rooms with tall windows and wood-plank or herringbone floors. Some have four-poster or canopy beds, balconies and seating areas. All rooms come with Illy coffee- and tea-makers, a fridge, flat-screen TVs, and free Wi-Fi. The black-and-white-tiled bathrooms have chrome accents; some have showers while others have combination shower-tubs. All have hairdryers and make-up mirrors. Referred to as the “Salon,” the lobby has multiple period rooms with high stuccoed ceilings, green velvet booths and vintage detailing throughout. In the back of the hotel and down a flight of stairs is the tiny Hotel Bogota museum. 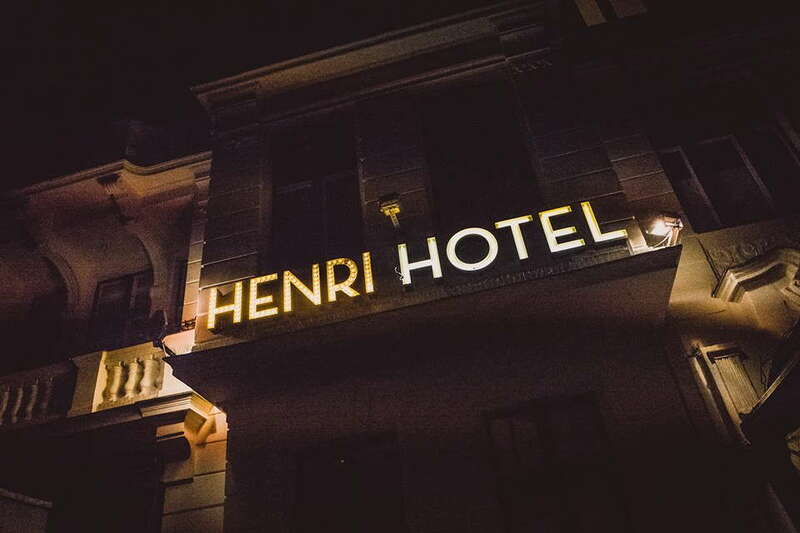 Film, fashion and music stars all congregated at the famous hotel, which closed in 2013; Hotel Henri acquired many of the photos, posters and other remnants, including the telephone booth where Kiera Knightley was photographed by Mario Testino for Vogue. While there is not a full-service restaurant, a breakfast buffet (16 euro) is served in the kitchen adjacent to the salon area. Monday to Saturday evenings, a free "Abendbrot," a typical German dinner of bread, sliced meats and cheese, is available from 7 to 9 pm. There is a very small bar area serving basic cocktails, wine and beer, or a 24/7 self-serve drink and snack bar in the lobby. 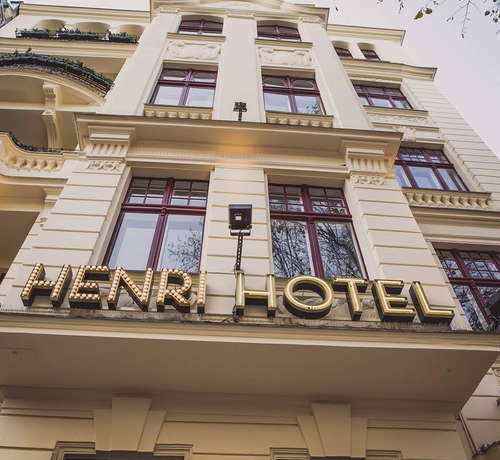 On a quiet side street off bustling Ku’damm, the hotel is a five-minute walk to the Kurfürstendamm U-Bahn station. Brasserie Colette (12-minute walk), a casual yet sophisticated eatery overseen by Michelin-star chef Tim Raue, is a favorite of locals. The top floors of the KaDeWe department store (14-minute walk) are home to a massive gourmet food court, with everything from steak frites to wiener schnitzel to sushi. The relaxed dining room and exquisite Franco-German menu at Diekmann (1-minute walk) make it a favorite of Charlottenburg locals. Dress smartly to gain admittance to the miniscule, 25-seat Rum Trader (5-minute walk), which boasts an excellent selection of rum- and gin-based drinks served in vintage tumblers. The diminutive Bar Zentral (9-minute walk), tucked inside the arch of the S-Bahn, has a cool, curved tile ceiling and excellent, affordable cocktails. 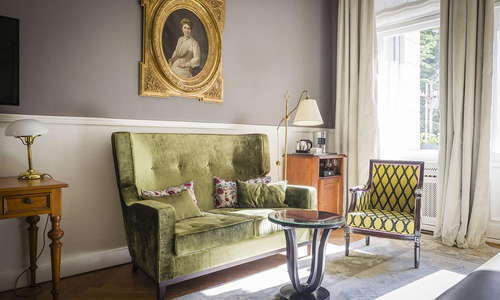 Individually designed rooms pay homage to the building’s history, with refined antiques, wallpaper, fabrics and paintings that conjure the feeling of bygone days, while still offering comfortable, modern-day amenities. The location is quiet, yet you’re only a block away from the main boutique shopping boulevard of Ku’damm.